Over the winter the waterways may become quieter but behind the scenes the marina staff are still working as hard as ever, maintaining the boats and updating their interior furnishings. Our partners at Norwich marina, Thorpe St Andrew on the Norfolk Broads are busily updating their Duet Class boats in their boat shed by the water. Further pictures can also be viewed on the Waterways Holidays Facebook page & in our winter boats album. Watch this space for new interior photos! If you would like to talk to one of our friendly team with regards to Norfolk Broads boat holidays or any of the boating holidays on the UK canals, please do get in touch. Our number is 01252 796400 and we are open 7 days a week. We recently had great fun at the hire boat sailing regatta on Barton Broad. The Waterways Holidays team chartered ‘Tropical Wind’, a 29ft Bermudan rigged yacht from the marina at Upton on the Norfolk Broads. A long established and popular event, the regatta takes place during Autumn each year and is open to participants who have previous sailing experience. Over 30 yachts compete in a series of races and enjoy social events, all culminating in an evening of good food and prize giving. 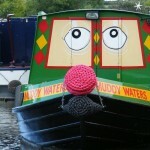 We asked Lesley at Waterways Holidays about her time at the 2011 Regatta, sponsored by Waterways Holidays. Which races did you take part in? Did you win any? We took part in the Shake Down Race, the All Comers Handicap Race, the Ladies Race and the Crews Race. Unfortunately on Monday the weather was too windy to sail. Very few competitors were able to sail Wednesday afternoon as there was not enough wind! We were joined by Tony Howes, who helmed the boat for the first time in the Crews Race. We came second in the Crews Race, 15 seconds behind first place. We won the Martham Ferry Boatyard Trophy for Tuesday’s races. We came third in the Ladies Race after an unplanned detour! It was great to feel part of such a fun and friendly event. I enjoyed the evening entertainment, sailing themed songs courtesy of Ted Handley and his harmonium. Any words of advice for 2012 competitors? Book a 7 night holiday on a sailing yacht so that you have a little time to familiarise yourselves with the yacht before you start. You’ll also get time at the end of the regatta for more relaxed sailing. Thanks Lesley for giving us your review of the Barton Broad Charter Yacht Regatta. Why not take part next year? The 2012 Barton Charter Yacht Regatta is 13th – 20th October. 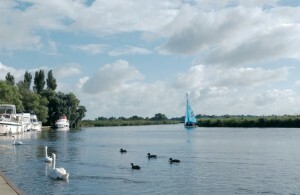 The Southern Broads offer a beautifully tranquil and relaxed boating break with wide open spaces and endless skies. Generally, the Southern Broads have fewer boats on the waters, ample mooring spaces and the rivers tend to be more noticeably tidal. A great location to drift downstream forgetting any of life’s daily stresses. Places you can visit include the historic city of Norwich, one of the most complete medieval cities remaining in Britain. Norwich Cathedral is one of the most impressive cultural landmarks to visit when in the city centre, boasting the second tallest spire in England. The cathedral is just a part of the culturally iconic landmarks to see in the City. It’s not just rich heritage that Norwich has to offer, the City is home to the Chapelfield shopping centre and has one of the largest open air markets, hosted six days a week in the city centre! The Broads offer a diversity of wildlife including red squirrels, birds of prey, rare species of dragonflies and ducks a plenty. A perfect way to experience the unspoilt nature is on one of the many walk’s available on the Southern Broads. Whitlingham Country Park is located at Trowse just south of Norwich, offering a variety of activities ranging from water sports, scenic walks, bat and moth evenings to quarry safari’s. Training is available for those wishing to extend their experience on the waters to other vessels such as kayaks and sailing yachts. Although the Southern waters offer a very tranquil experience of the Broads, lets not forget the need for riverside pubs! Coldham Hall at Surlingham, situated on the River Yare, has recently been refurbished reforming the hall to its original glory. A popular watering hole to dine in for your evening meal with as many locally sourced food as they can manage. Dukes Heads in Somerleyton and The Humpty Dumpty Brewery at Reedham both offer a taste of the real locale ales for those wishing to sample the local brews. Beccles is an up and coming regional market town, with lots of independently owned shops and unique eating establishments. For a fun filled family day out visit Pleasurewood Hills Theme Park with over 30 rides to experience. Alternatively there are plenty of trails and fishing opportunities available during fishing season, (from the 16th June to the 14th March), or simply take a gander at a few of the boutiques and local heritage. Perfect for a mid week holiday. You can spend the day touring the historic Norwich city and stop off at The Pettitts Animal Adventure Park at Reedham on the way back to the marina. For a weeks break, you can detour down the River Chet and experience Loddon and the Hardley Flood. Spend time cruising the boat down the picturesque River Waveney then onto the River Chet, ending up at the little town of Chedgrave. The Hardley Flood is a SSSI built as a spillway from the River. The tidal lagoons and reed-beds attract a diverse range of wild birds and nesting wildfowl. A tucked away ramblers and ornithologist paradise, as its one of the quietest of the Broads rivers. The Southern Broads really do offer a bit of everything to make a perfect holiday for first timers and experienced boaters alike! If you would like to talk to one of our friendly team about Norfolk Broads boat holidays, please do get in touch. Our number is 01252 796400 and we are open 7 days a week. 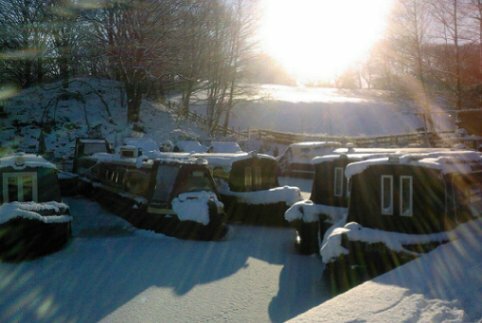 Dont miss out this season, many of the marinas are running narrowboats throughout the winter months and even through the Christmas and New Year period. It’s a perfect retreat from all the hustle and bustle of last minute christmas shoppers and overcrowded supermarkets. The canals during winter are simply picture perfect, with misty mornings, snowy branches and tranquil waters. A great way to experience the British countryside at it’s most peaceful. On a canal boat with a solid fuel stove on board, you can have the fire burning on a frosty evening, with a glass of mulled wine and some great company. The stoves are a charming feature of a traditional narrowboat and a great finishing touch on a chilly night. For example, a boat running throughout the winter period is ‘Boston Belle,’ a characterful narrowboat on the Leeds & Liverpool Canal, equipped with quaint white furnishing and a traditional log burning stove as well as full central heating. The marina at Hillmorton, near Rugby, will be operating throughout the winter season, offering Christmas and New Year hire. This marina offers a romantic two berth boat, ‘Heron’ with a fixed double bed and solid fuel stove and full central heating. The Hillmorton location is ideal for those still wishing to spend a few hours cruising, as the lockfree Ashby Canal is just north of the marina, so there are generally no stoppages affecting this route. Winter canal boat hire is also a perfect way to experience the nearby cities, without the hassle of finding a car parking space! Bath Christmas Market, running from the 24th November, is accessible from Bradford on Avon, on the Kennet and Avon Canal. Or why not check out the Warwick marina, just a short train journey from Birmingham city centre and an abundance of high street shops at The Bullring Shopping Centre. All of these winter ammenities just a short journey from your tranquil floating home. Click here to search all our canal boat holidays or give us a call on 01252 796400. 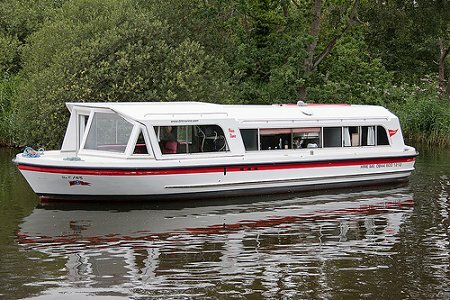 We often receive enquiries from people new to boating who find it a challenge to determine which style of Norfolk Broads boat hire will be the most suitable for them. To give you an idea of what you can expect, here’s a handy guide to understanding your Norfolk Broads motor cruiser! 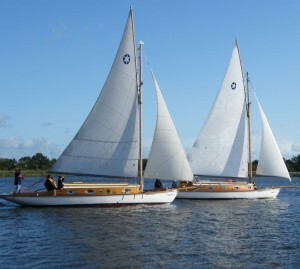 A luxurious example of a dual steering cruiser at Potter Heigham is the ‘Superior Light’ (above). Fully equipped with spacious saloon and open plan galley. The boat includes a LCD TV and DVD player, a playstation 2, warm air heating, 240V power supply and two separate cabins with two ensuites. The boat also has bow thrusters for easy mooring and offers two separate steering positions, either outside or inside depending on the skipper’s preference. The ‘Merrymore’ at Wroxham is an example of a centre cockpit cruiser, characterized with the full sliding back canopy over the saloon. Much like a convertible you can choose to steer with the roof back or for less ideal weather conditions put the canopy back over. The steering position on a centre cockpit cruiser is generally raised. When the canopy is back it may be possible to navigate under the particularly low bridges (depending on the tides). The Merrymore is also perfect for those wishing to fish on the rear deck. The marinas at Potter Heigham and Wroxham are both offering up to £100 off all October holidays taken before the 20th October. 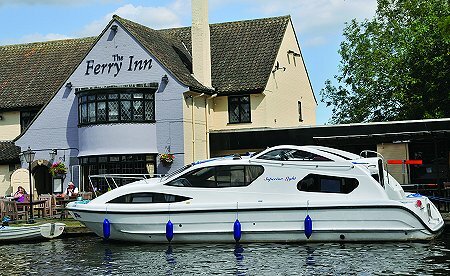 The marinas at Stalham and Acle are currently offering under occupancy discounts for a party of two people on a four berth boat. 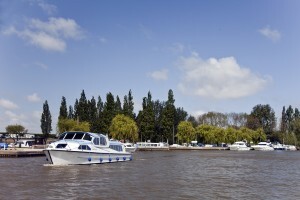 Couples venturing on their first Norfolk Broads boat holiday can benefit from a saving of £50.00. An example of a sedan cruiser that would be applicable for this offer is the ‘San Remo’. On board this boat is a fixed double and an additional fixed double in a second cabin if required. The Sedan Cruiser is characterised by two large glass doors that allow easy access into the rear of the boat, from here you step into the saloon area with the dining table and sofa, along with the raised steering position. The large glass doors and windscreen for the skipper on this model of cruiser gives the dining area a spacious open plan feel. Forward steering cruisers, as we have mentioned in previous posts, are great for those wishing to take a pet or avoid too many steps as they are usually one level inside. This model of cruiser is particularly useful for getting under the low bridges on the Broads as they arent built too high. 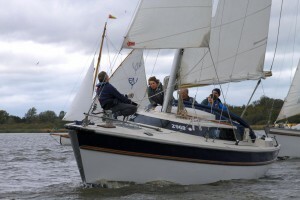 An example of a forward steering cruiser is Fine Time at Ludham. This boat is particularly suited for couples as it has a fixed four poster double bed on board. This marina is also currently offering a 10% discount and free parking on your Norfolk Broads boating holiday. So dont miss out on your first Norfolk Broads Boat Hire with so many superb varieties to choose from and fantastic offers to take advantage of! 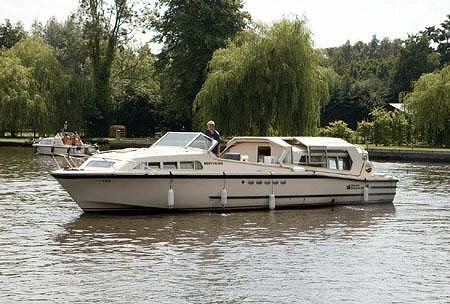 For live availability of Norfolk Broads boating holidays just search online with us, Waterways Holidays. 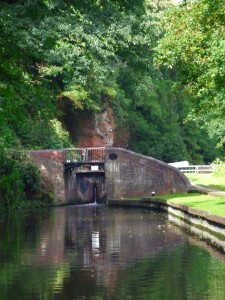 Trudi, an experienced narrow boater and member of the Waterways Holidays booking team, writes about her latest journey on one of her favourite canals, the Staffordshire and Worcestershire Canal. 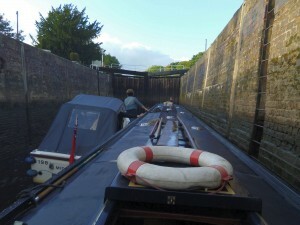 We began our journey from Northwick, just North of Worcester, on the 69 foot narrowboat ‘Transcendence’. Turning onto the River Severn we were instantly blown a short distance sideways down the River by the wind (our jaunt coincided with the arrival of hurricane ‘Katia’ which hit our Western shores over the weekend of 10thSept) but quickly managed to right ourselves to head North towards Stourport-on-Severn. Our crew consisted of myself , ‘Captain Ken’ (as he likes to be known) our two faithful hounds Tasha and Banjo and two friends who had never narrow boated before, Claire and David, who soon fell in love with the whole boating experience. We taught them how to steer the boat using the tiller whilst we travelled up the River as it’s much wider than the canal. A cloudy sky reflected in the wide open waters as we cruised happily along spotting wildlife, church spires, motor cruisers and millionaire mansions. There are mechanised locks on the Severn and we pulled in to the left-hand side in order to share with another group on a motor cruiser, chatting away together as the water level rose. These large locks are all manned by lock-keepers, and this lets you get used to handling the boat in a lock (if you’re unsure) before attempting the smaller ones yourselves. The skies opened at one point and it pelted down, but our trusty golfing umbrella kept the worst of it off and any disappointment was made-up for by the fabulous rainbow that appeared to our right above the trees and the cottages. At around 6pm we moored up outside ‘The Angel’ in Stourport and stopped there for the night, our only disturbance being the ‘Disco Trip Boat’ that passed us twice that evening, much to our hilarity. The first set of ‘real’ locks are found at Stourport and they are not typical, as you need to fill one lock from the other, checking beforehand that no-one is coming down the other way. These lead into the Stourport Marina / Basin where you can re-fill with water if needed. The Marina is rather interesting, with it’s familiar clock tower and wind-dial rising above the many rows of colourful boats moored below. The locks are surprisingly narrow and entering them is like threading a needle, but they fill quickly, which is always a bonus. As we left the marina we began our discovery of the Staffs & Worcs. (as it’s known in short). And the sun came out, thank goodness. At first the area surrounding the canal was quite urban, with terraced houses and playing fields overlooking the waterway. Gradually these receded and countryside prevailed, with a meandering route that takes you under bridges and past pretty cottages, skirting the over-hanging willows en-route. Soon, we reached the outskirts of Kidderminster, where we stopped at a big ‘well-known supermarket’ which is conveniently situated right alongside the canal. As we continued, we wondered at the intricate Victorian architecture of ‘Weavers Wharf’, once a textile mill providing yarns for the booming carpet industry Kidderminster became so famous for, now a shopping centre re-opened in 2004 which houses chain stores, shops and restaurants. 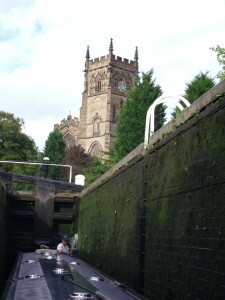 From under the dark and artistically graffitied bridge number 16 (below a main roundabout) at Kidderminster Lock, we emerge slowly upwards to see an absolutely gorgeous church tower, complete with turquoise-blue clock face….a real photo opportunity. As we wend our way further along the canal, the countryside opens out into green and golden fields, fringed with bullrushes and grasses. The map says that there’s an aqueduct here but it must be hidden by the trees. The route becomes more wooded, with the various colours of leaves rustling on the trees above us and reflected in the tranquil waters below. One thing we are enjoying very much is that the locks are quite far apart which allows for a lovely long run-up, with much appreciation of the surrounding scenery and many wild flowers along the way…reminding me of a book with intricate botanical illustrations. There are also many interesting red and yellow sandstone rock formations along some parts of the canal, at one point we see that caves have been made out of the rock and I understand that these caves can be found in surrounding areas too. On our second evening we passed Wolverley and stopped just after the Cookley tunnel, which is just 65 yards long and is cut out of the local sandstone which passes directly under the town itself. The walk up from the towpath to the main road is very steep (beware) and even more difficult with two bags of delicious food from the local, very reasonably priced, curry house! 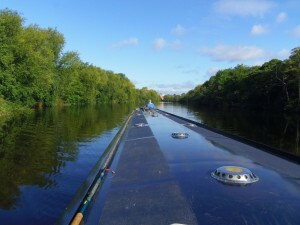 The next day we continued on towards Stourbridge with the strong winds whipping at the sides of the boat and making it quite hard going for Captain Ken and slowing our progress. The scenery however, was delightful. Even the gardens of houses that we passed were either landscaped beautifully or had vast vegetable patches, where ducks, geese, herons and squirrels roamed. Fields of sheep, drinking from shallow patches of the canal were interspersed with summer houses and follies. We stopped at Kinver for a walk around the town, which was very traditional with it’s butcher, antique shops, baker and pubs (also supermarket, Chinese take-away and fish & chip shop). There was a lovely ivy-clad walkway between shops which lead to a café, where we stopped for a late breakfast. When we returned to our boat, we decided to turn around at the canal junction for Stourbridge rather than continue to the town itself, as we were being hampered by the wind. Executing a perfect 6 point turn at the winding hole, we progressed back the way that we had come. Believe me, it often looks completely different on the way back (for those of you who dislike the thought of ‘out & back’ cruises) and although we re-visited several places that we had already passed ….the white cottage next to Whittington Lock which actually has miniature lock gates to it’s front garden, the house which was completely covered in creeper, the arched viaduct stretching high above us, pubs that we decided we might try on the way back, the beautiful church spire, the open fields, 2 kingfishers! …..it was just great! 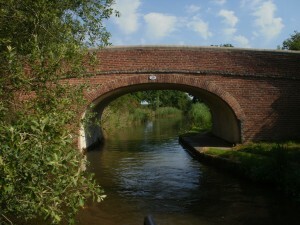 Thanks Trudi for giving us your review of the River Severn and Staffordshire & Worcestershire Canal. So the weather is getting a little less ‘Summery’ and the nights are drawing in, it may not seem like the best time of year to go on a boat holiday on the Norfolk Broads, right? Wrong. It’s actually almost an ideal season for a boating trip! The Broads are generally less busy, making it less competitive for free mooring spaces and less time waiting for your afternoon grub. There is still plenty to do and see, so I thought I’d provide some events not to miss and must see things to experience for a bit of holiday inspiration! An annual yacht regatta is due to take place from the 8th October to the 15th October on the Norfolk Broads next month. The event is an established series of sailing yacht holidays. Experienced yachtsmen are able to hire sailing yachts from Upton or Horning for the week, enter into the competition and enjoy some competitive spirit! Communal social activities are also scheduled for the evenings of the regatta period, including the prize giving and regatta dinner. Barton Broad is the second largest Broad in Norfolk, reputedly Admiral Nelson’s sister once lived in Barton Hall and Nelson himself learnt to sail on this Broad. It’s is brimming with wildlife, being part of Britain’s largest nature reserve. Along the Barton Broad is a nature trail that leads you through ancient woodland to a platform with views of the waters awaiting you. BeWILDerwood is a children’s adventure park, open all season until the 30th October. Snagglefang’s spooky spectacular event is taking place this October half term from the 24th. Not to be missed if taking young children on your boating holiday, with mask decorating and lantern making festivities taking place at the park. On saturday the 8th October a Norfolk Farmer Market event is taking place here, where you can pick up some of the locals finest food collections, or simply go for the free tasters! Other attractions at Wroxham Barns include mini golf course, a farm and shopping facilities, which are open through out the year. Norfolk is famous for its churches and historic landmarks, some of which can be spotted from the Rivers and others you can moor up and explore. Medieval churches to check out include ‘St Helens Church’ in Ranworth, dating from the 14th century, this is one of largest Churches on the Broads. Famous for a Medieval Latin book produced in 1460, that is on display here. ‘Langley Abbey’ on the River Yare opened to the public just last year, and visitors can stroll around the Abbots cellar and check out the private chambers and stone carvings created back in 1197. Open all year this railway offers the traditional steam train experience. The train is taking on a Halloween theme called ‘the Spooky Express’ from the 22nd to 30th October. 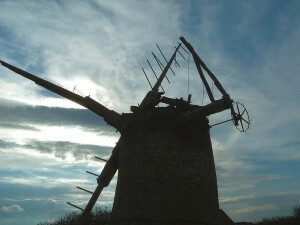 There are lots of competitions for the children to take part in, and beautiful Norfolk views for the adults. 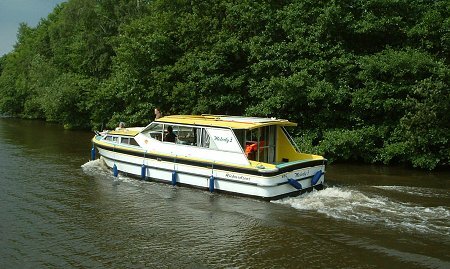 The Norfolk Broads remain alive all year round, all of which can be experienced on a holiday afloat! Pet friendly boat holidays… We think so! 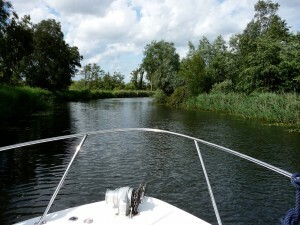 We recently posted about Norfolk Broads boating holidays being an ideal holiday for pet owners. Recent holiday goers have shown us just how versatile our boats can be for all sorts of pets, and we thought we would share the latest pet pictures with you! On the 26th of August we welcomed the Simonnet family onto a boat going from the Wootton Wawen marina in Shakespeare Country. In a week’s break you can expect to cruise to the historic town of Stratford-upon-Avon, a town drenched in culture and beautiful architecture, as well as being William Shakespeare’s birthplace. From the Stratford-upon-Avon Canal you can journey onto the River Avon, where you can experience countryside cruising, vast skies and moor up at ‘Cotswoldy’ towns such as Bidford and Evesham for some classic pub dining. A beloved pet of the Simonnet family, ‘Crispy’ the Pekin Duck, was a passenger on this voyage! Armed with a pink frilly nappy, the boat yard was happy to accept this slightly less orthodox feathery companion on board. Just goes to show, you really can take just about anything on your holiday afloat! With thanks to Dominic Simonnet and his family for supplying us with some lovely images of their boating trip on the Stratford upon Avon Canal, more of which can be seen on our facebook page. Children and adults alike are set to love an entirely new boating holiday experience – child friendly narrowboat ‘Muddy Waters’ on the South Oxford Canal. 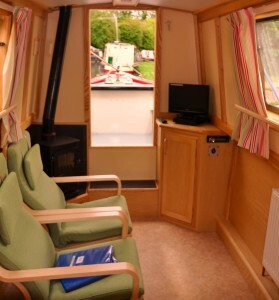 The base at Lower Heyford boasts a modern fleet of beautifully maintained narrowboats sleeping up to twelve people. The latest addition to the hire fleet is 69ft ‘Muddy Waters’, a semi-traditional style character narrow boat designed especially with children in mind. Sleeping up to four adults and four children in two doubles and four single bunks, ‘Muddy Waters’ is packed full of goodies, including fun features for children and extras for adults. Located in the bow of the boat, the dining area has been magically transformed into a children’s playroom. Complete with bean bags, a widescreen TV with Wii games console and a play table, the playroom is the first of its kind on a narrowboat. There’s plenty of extra storage for toys and a large floor space for family play time. When you book your holiday you will receive a free ‘Muddy Waters’ children’s book to read before you start your big adventure. The playroom is situated at the front of the boat next to the children’s bunk beds, so the children don’t need to sneak past mum and dad! In the top corner of the playroom there is a camera which is linked to a TV monitor at the stern of the boat, so whilst driving you can still see and hear your children playing for peace of mind. Not just a holiday for children, the rear galley is a sophisticated space designed with adults in mind. The TV monitor doubles as a TV/DVD for adults wanting to stay up past their children’s bedtime in the evening. Waiting for you on arrival is a bottle of wine and other grown up goodies. Situated on the South Oxford Canal and close to Oxford City centre and the River Thames, there’s an abundance of things to see and do. A fusion of contemporary culture and historic charm, Oxford City centre has lots to offer. Skirting the Cotswolds, the Oxford Canal meanders alongside picturesque parks – great for a family picnic and a chance to walk the dog. A must see for children is Oxford University’s grandest college, Christ Church. This building was the inspiration for Lewis Carroll’s novel, ‘Alice in Wonderland’. J.R. R. Tolkien and C. S. Lewis frequently visited Oxford centre to relax in the many public houses. Within easy reach of your floating holiday home is the magnificent Blenheim Palace. Set in 2100 acres of beautiful landscaped parkland, the Palace is the birthplace of Winston Churchill and home to the 11th Duke and Duchess of Marlborough. An adventure on ‘Muddy Waters’ brings imagination to life; it’s simply an unforgettable canal boating experience for all ages. The sleepy Droitwich Canals have just reawakened after almost a century of closure. Years of restoration work estimated at a cost of approximately £12.7 million have been invested into the reopening of the canals. The canals and the River Severn link to form the Mid Worcestershire mini Ring-perfect for three night breaks. The Droitwich Canals, being some of the oldest, were designed by James Brindley, to connect the River Severn with Droitwich town’s salt industry in 1771. After the introduction of the rail network, and following competition from other industrial developments, the Canals were no longer required. The mid 1920’s saw the last boat to cruise the Droitwich Canals before their closure. The ring stretches approximately 22 miles and consists of 30 locks, achievable in a short break and ideal for holidaymakers wanting to do a ring that isn’t too ambitious. Having just done the Mid Worcestershire Ring, how easy did you find it to achieve in a weekend break? It was comfortable, although we did keep an eye on the time as there are so many distractions along the way! The boat yard at Stoke Prior was really helpful. On arrival, they chat with you about the route, places to moor and eat out before you depart. What did you experience each day? We left Stoke Prior at about 3pm and arrived at Dunshampstead within 4 hours of rural cruising, to moor up for dinner at The Fir Tree Inn. The Fir Tree Inn is a pub/restaurant recommended to us by the marina, with lots of great food on the menu and a good selection of real ales and wines. We arrived at Worcester City centre at about 3pm. If you want to go into the City centre, then its best to moor up above lock 3, and simply cross the bridge. Worcester is a very picturesque city with lots of charming architecture and greenery. 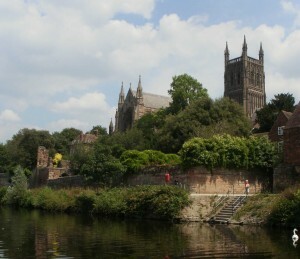 The magnificent Worcester Cathedral can be seen towering above the City from almost everywhere. The afternoon was spent exploring the beautiful City and shopping with the girls in the many high street stores. After a pub dinner, we moored overnight at one of the 48 hour mooring spaces. We journeyed up the River Severn, a stretch with no free mooring spaces- so don’t forget some change if you’d like to stop. The only lock you come to on this part of the river is manned, so just wait for the go ahead and drive the boat in, watching the lockkeeper do the work. It took approximately two hours to get to Droitwich Spa and we moored up at Vines Park, where you can eat out in the town or shop at the Waitrose nearby. We discovered Droitwich is a town known for its salt spa, which is equal in salt density to the Dead Sea. This area is a very pretty, historic hub with lots on natural heritage sites. Thanks Dawn for giving us your review of the Mid Worcestershire Ring.